Doncaster Knights will break new ground when entertaining Ealing Trailfinders in Saturday's Championship clash. 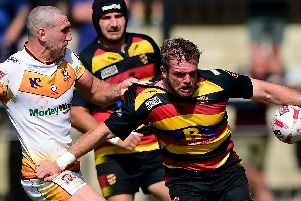 It will be the first-ever meeting of the two clubs, who exchanged positions in 2013-14 following Knights' relegation to National One and Ealing's promotion to the Championship for the first time. The game is likely to see a return to Castle Park for former fly-half Tristan Roberts, who joined the London side in the summer after playing 19 games for London Welsh in their ill-fated Premiership campaign. But Roberts will not be playing against either of the two fly-halves brought in by director of rugby Clive Griffiths during the summer with Declan Cusack joining Simon Humberstone, injured in pre-season, on the sidelines after suffering a fractured eye socket in the second game of the season at Nottingham. “It's frustrating but unfortunately injuries are part and parcel of the game,” said the former Plymouth Albion half-back, who wasted no time in impressing against Welsh in a game he felt they should have won. With Humberstone also showing up well in pre-season games, competition for the No 10 shirt looks set to be intense when both men are fit - a point not lost on Cusack. “With Simon being ruled out following a shoulder operation I got first chance to stake a claim for the No 10 shirt and I was looking to kick on after the Welsh game,” he said. “That hasn't happened but I'm sure I'll get another chance when I'm fit again. Rather than bring in someone on loan, Griffiths has opted to switch scrum-half Michael Healey to fly-half - a move supported by Cusack. “It's a difficult thing to do but Michael has shown that he's got both the skills and the temperament to play there; he's a class operator,” he said.